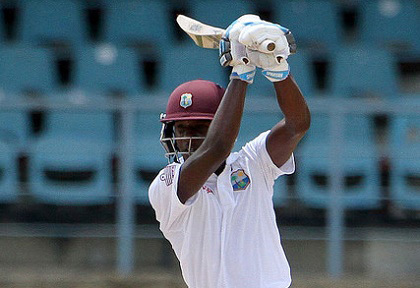 GEELONG, Australia, CMC– Middle order batsman Jermaine Blackwood said he almost lost concentration as he was forced to battle extreme heat on his way to a polished half century for West Indies against Victoria X1 on the first day of their two-day tour match yesterday. Blackwood compiled a well-played 69 to bolster his confidence after scoring a couple of ducks in the first Test as West Indies amassed 303 for eight at Simonds Stadium. The diminutive Jamaican batsman who scored seven fours and a six said it was the first time he experienced such extreme heat as temperatures soared to 43 degrees, one of the hottest days on record in the history of Australia. “It was extremely hot out there…dry heat…even when the wind came across the ground it was a kind of hot wind…I’ve never experienced anything like it,” said Blackwood. “We’ve played in hot, sticky conditions, but never quite like that”. “I was quite tired after running some threes, it’s a big ground so we had to run a few threes. At one point I felt like I was losing concentration so you had to dig deep for every ball,” said Blackwood. West Indies are using the match as part of their preparation for the second Test match at the iconic Melbourne Cricket Ground, starting Boxing Day. “We’ll just have to go back into the nets and continue to work hard,” he said.